Parker lately has been having gelastic cataplexy attacks very frequently. We've had both Brisan & Parker on medicine to help this but the last 3-4 weeks Parker seems to be reacting differently to the changes Niemann-Pick Type C is placing on his body. This is all to be expected. Sadly we have to keep him and Brisan more in their chair although we hate doing this. The other challenge is we can't be a 100% of the time hovering over both of them to keep them safe. It just isn't possible and especially with a little squirrelly three year old running around. 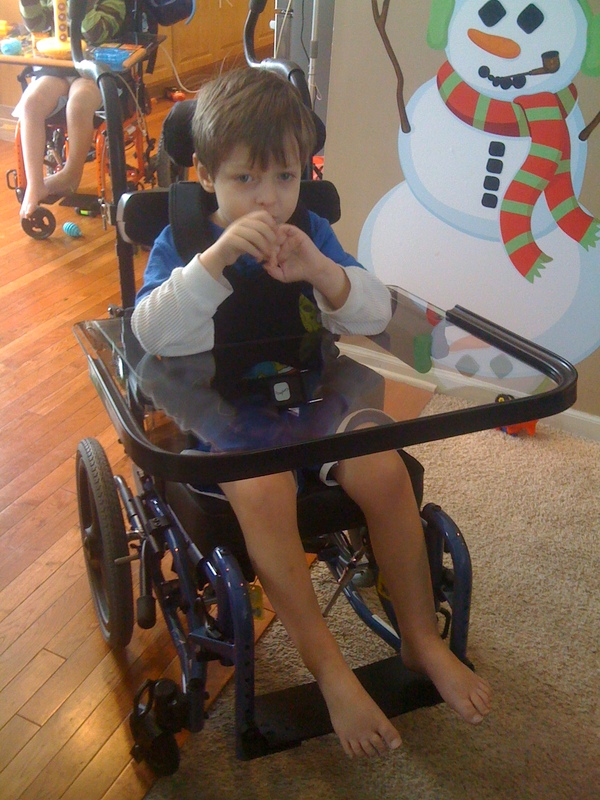 Starting on the next school day (depending on when that will be with all the snow expected tonight), we will be sending Parker to school with his wheelchair just like Brisan. Now that doesn't mean he can't get out and roam around but it will provide a safe haven for when he is unstable. This has worked well for Brisan at school. It just takes one good fall to do some serious damage. You and I don't think much about this because we typically have enough control to protect ourselves on a fall. It would be like free falling out of the sky and hitting the ground. There is nothing you can do to soften or protect yourself from the impact. Last week Parker fractured his nose (1/22) because he fell. That all happened within a matter of minutes. Here is a video we shot on Sunday (1/30) showing Parker laughing. He was going really good earlier before I grabbed the video camera to record. You'll notice he has a couple good head drops along with the vertical gaze palsy (issues with moving the eyes up/down/side to side. the “awkward” eye movements.) Plus the poor kid needs a hair cut????!!! !